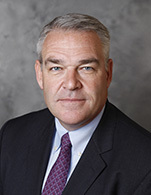 Andrew Swanson has been with Morgan Stanley for over 25 years. He currently Heads the Wealth Management Equity Trading desk, which includes Principal and Agency Equity Trading for all domestic and international equities and options, including all ETF executions, for the Wealth Management division of the firm. He manages 12 Traders responsible for trading all equities across all international markets and oversees executions in over 50 million shares per day. He is a member of Morgan Stanley's Best Execution Committee. Prior to managing the Equity Trading Services desk, Andrew managed the firm's Nasdaq Marketing efforts. He started with the firm as a senior member of the Equity Research Sales group. Andrew has over 30 years experience on Wall Street, and has a BA in Economics from the University of Vermont. He has also studied at New York University's Stern School of Business and University of Pennsylvania's Wharton School.